Use this calculator if you pay twice per month (1st-15th and 16th-EOM) and have multiple hourly rates. 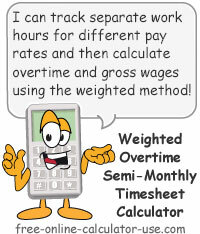 The calculator uses the weighted average method for calculating overtime pay. You can allocate each time block to any one of up to 5 custom activity rates. This section allows you to associate a rate description and hourly rate of pay for up to five different rate Id's. These numbers can be entered in the # field of each In/Out column. Note that you can set the default rate number for each in/out column to 1, so you will want to enter the most common rate in the first row. You can also fix each # field so the time block column is automatically associated to corresponding rate id (choose "#1-5" from the default rate menu). Choose the default rate ID you would like to populate each time block rate field with. Changing your selection after entering times will overwrite any existing rate id's with your selection. If you choose None the rate fields will be blank. In this case you must enter a rate ID for all time blocks with entered In/Out times. Choosing #1 will populate all rate fields with "1". You can change the default to the applicable rate id as you enter times. Choosing #1-5 will populate the first time block with "1", the second time block with "2", and so on. This selection will also hidedisable the rate # fields to avoid unnecessary tabbing. This section allows you to set the regular hour cap, the starting and ending pay period dates, and the daily time-total format. Enter the number of pay period hours after which overtime kicks in. Select the month, day, and year of the semi-monthly pay period you want the timesheet calculator to start at. The Day column will automatically be filled in with the correct days and dates. Note that in order for the calculator to operate, the number of days between the selected starting and ending pay period dates must be greater than 12 and less than 18. Timeframes that fall outside of 13-17 days will cause the In/Out fields to be cleared. Select the month, day, and year of the semi-monthly pay period you want the timesheet calculator to end at. The Day column will automatically be filled in with the correct days and dates. If you would like the calculator to display time totals in hours:minutes format (7:30), choose the HH:MM option. Or, if you would like the calculator to display time totals in hours:fractions-of-hours format (7.5), choose the HH:HH option. If you're working with a saved set of entries, and would like to clear just the entered times for the current data record (leaving the payroll settings as they are), tap the button in this row. To commit the clearing of the timesheet to the saved data for this calculator, be sure to save the changes to the data record. Depending on the width of the calculator, a different entry form will be displayed. Narrow widths will display a mobile optimized form, whereas wider widths will display a desktop optimized form. For each day in the period that you accumulated work time, tap the "+" icon to expand the day. Next enter the In and Out times for each time block you were getting paid for. Once each day is completed you can either leave the day expanded, or tap the "-" icon to collapse the In/Out times. Important! When entering times only use numeric characters 0-9 with or without decimal points (no colons). The calculator will know that "130" means "1:30" and will insert the colons for you in the results. Important! You can enter times in standard (130) or military (1330). However, if a time block exceeds a 12 hour period you will need to use military time instead of standard time. If you're not sure what the military time equivalent of a standard time is, tap the grid icon in this row to open the Military Time Conversion Chart. Choose the number of time blocks you would like to show for each day. This selection does not change any time field entries, it only shows and hides columnsenables and disables the column's entry fields. This is the calculated sum of the hours associated to Rate #1 for all days worked in the pay period. This is the calculated sum of the hours associated to Rate #2 for all days worked in the pay period. This is the calculated sum of the hours associated to Rate #3 for all days worked in the pay period. This is the calculated sum of the hours associated to Rate #4 for all days worked in the pay period. This is the calculated sum of the hours associated to Rate #5 for all days worked in the pay period. This is the calculated sum of the hours worked for all days worked in the pay period. If you selected the HH:MM format, this total will be listed as hours:minutes. Or, if you selected the HH.HH format, this total will be listed as hours.fraction-of-hours. If you would like to print out a summary of the time card, enter or edit the ending date as you see fit, and then tap the "Printer Friendly Report" button. If you will be printing the completed time card report for a specific employee, enter their name here. Optional: If you wish the printed time card report to include the pay period ending date, enter the date here in whatever format you prefer. Convert punctuated time (colon or decimal) into entry format required by calculator. Multiple Pay Rates? Average OT Method? I own a company who deals with the Developmentally Disabled and in the past I have not had to pay overtime under FSLA for the personal care and respite services (companionship services) but now I do. My employees have 3 different rates that they are paid and we are paid twice monthly. I use the weighted method for figuring overtime. Do you have a program that will figure this for semi-monthly paychecks? To be honest, I had never heard of the weighted method for calculating overtime, but the visitor was kind enough to send me the formula. And viola! The calculator has become a reality! Note that if you pay on a semi-monthly basis, but you use one of the traditional overtime methods, please visit the original semi-monthly timesheet calculator. If you or your employees are paid different rates for different jobs, this calculator allows you to assign each rate to a number, and then assign each In/Out time block to the applicable number. The calculator will then total up the hours and wages for each rate of pay, plus calculate the total regular wages for the pay period. If your company falls under FSLA's personal care and respite services category, and you are required to pay overtime based on the weighted average method, this calculator has you covered. The calculator finds the weighed average hourly pay from the various rates entered, and then divides that number in half in order to arrive at the hourly overtime rate. Next, if the number of hours worked exceeds the overtime threshold, the calculator multiplies the overtime eligible hours by the hourly overtime rate to come up with the amount of overtime pay to add to the regular wages. If you would like the Timesheet Calculator to calculate your gross pay for you, complete the rate description and hourly rate for each different hourly rate you will be tracking. Select the default rate option you would like the calculator to use. Enter the number of pay period hours at which the average overtime method will kick in. Select the month, day, and year of the date the pay period starts on. Select the month, day, and year of the date the pay period ends on. Select your preference for how the calculator formats the time totals (HH:MM or HH.HH). Select the number of time blocks per day you would like the calculator show. For each workday in the pay period, open the corresponding day title and enter your In and Out times and applicable Rate id's for that day. The calculator will update the total each time you enter a new In/Out/R# set of times. Once all In/Out times are entered for all of your workdays, and if you completed the rate entries in the top section of the calculator, you can tap the "Calculate Gross Pay" button. This will populate the hours and wage detail table located just below the button. Fill in the name and end date (both are optional), and then tap the "Printer Friendly Report" to open a wage and hours report that you can print out and file for your records.